Cambridge University Wireless Society (CUWS) regularly undertakes short IOTA or SOTA expeditions, and, normally once per year, operates from somewhere in northern Europe. Recent activities have included Iceland (2005), The Faroes (2006) and Svalbard (2007). 2007 is our 75th year on the air, and has been particularly busy, with IOTA trips to St Kilda, and most recently to Les Minquiers (The Minkies) in the Channel Islands, near Jersey. The Minkies (EU-99) are a large collection of rocks approximately 10 miles south of Jersey (QRA IN88xx); they are part of a reef, which can be seen on clear days at low tide from the southern coast of Jersey. However, Jersey has some of the largest tidal ranges in the world, and only a few of the rocks are permanently above the sea line. The most significant island is Maîtresse, which is about 50m long and 20m wide. It is steeped in history and has an assortment of around ten stone cottages in various states of repair, including the most southerly toilet in Britain (often the subject of QSL cards in the past – see http://www.seapaddler.co.uk/Toilet.JPG). There is no power or running water, but there is mobile telephone reception. 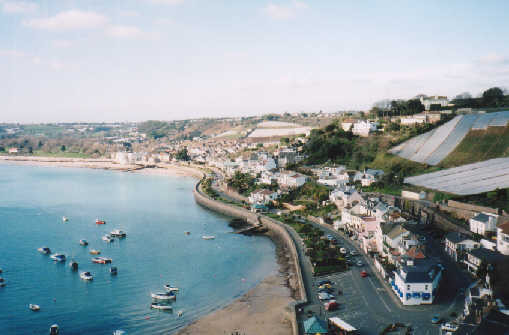 Following a long-running (but friendly) dispute between Britain and France, the reef, along with the nearby Ecrehous, was awarded to Jersey by the International Court of Justice in 1953. They made the news headlines again in 1998 when there was a French ‘invasion’, which lasted one day. The Minkies are close to both France and Jersey, but the waters around them are treacherous, and most mariners avoid the entire area, following an extensive network of buoys to avoid the possibility of running aground on the rocks. It is this difficulty of access which makes EU-099 an enigmatic and attractive target for radio expeditions. Our visit to the Minkies (IOTA EU-099) took place between 3 – 5 September, 2007. 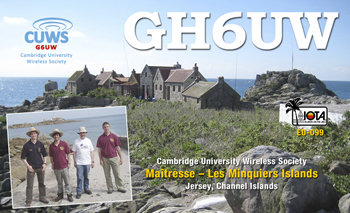 We were pleased to use the unusual Jersey club prefix, giving us the callsign GH6UW. The team consisted of alumni: Martin G3ZAY, Dominic M0BLF, Tim M0TDG and Michael G7VJR. Early discussions in April 2007 with Jersey contacts revealed that visiting the Minkies would not be possible without a degree of support from the local harbour in St Helier. A previous radio expedition had run into difficulties during the IOTA contest in 2004, and as a result there was some reluctance to conduct another radio trip without additional reassurances and planning. Indeed, our initial request to go to the Minkies was declined immediately. For CUWS, any expedition comes with the additional responsibility of representing an internationally recognised University. In this case, we felt it was best to persevere. Further correspondence followed, and our plans were eventually accepted, having now explained our approach and willingness to treat the islands with care. This, however, was not all. We were delighted to now receive an offer of transportation to the Minkies from the Jersey coast guard, and use of the Jersey States building on Maîtresse. Suggested times to make good use of the tides and advice on the trip were also given to us. This additional help gave us a great head start; we would have a roof over our head and would be able to avoid using an expensive chartered boat, and side-step some obvious problems with the benefit of local knowledge. We flew into Jersey cheaply, but this gave us an added problem of carrying only what our hold baggage could contain. When it comes to radio equipment, power supplies and linears are never light enough. After hiring a car, there was just enough time to shop for provisions, obtain water and fuel and a Honda generator on Jersey. As the tidal waters dictated our departure time around 1pm on Monday 3 September, we were sure to double check that we had everything we would need to be fully ready for departure. A frantic morning! After ferrying our equipment down to the Albert Quay in St Helier, we were amazed to be invited aboard the Duke of Normandy, a 500 tonne vessel which is normally in full-time use manoeuvring cargo ships and the like. Our kit was loaded onboard and we departed, in perfect summer conditions. GPS maps and sonar equipment showed our progress into ever more complex shipping lanes around the Minkies. When we reached Maîtresse (about 1 hour later), we transferred to a smaller craft that had been towed by the Duke Of Normandy, and disembarked onto the shores of the island. Arriving is a special moment on any expedition. The weather was perfect as we came ashore. I will not forget the clear, shallow waters and the wonderful weather that graced our entire trip to the Minkies – we were treated to beautiful sunrises and sunsets, and luxurious summer weather. My fears of having to abandon our trip due to poor weather (remember it flooded in July!) were unfounded. Although rocky, Maîtresse and the outlying rocks are charismatic and charming, and to be able to swim in the sea was the ultimate refreshment. As we carried our equipment to the top of the slip way and onto dry land, our priorities quickly turned to commencing our radio activities. We had just 48 hours to make as many contacts as possible. We were soon able to erect a 20m vertical antenna on top of the highest point, using a 10m SOTA pole. 9 elevated radials were used. The rig was an Icom 706 with 300W (using an inexpensive RM500 AM/SSB linear). Dominic M0BLF began CQing on 20m SSB, logging to WinTest in DXpedition mode. A pile up was quickly underway and Dominic reached a rate of 180 Qs/hr. We were keen to put two stations on the air, and had brought a range of 100W Dunestar band-pass filters. The next station to go on the air was for 30M CW, which we judged would be a good, long-haul band which would benefit from our 360 degree salt water take off. Using an Elecraft K2/100 (completed just days before the expedition and barely tested), Michael G7VJR began operating on 10MHz using a lead acid battery outside. Within 15 minutes or so, GH6UW was split and listening up around 2kHz. The DXCluster had, presumably, started to draw attention to our activities. With no mutual interference, we were delighted to be putting out a solid signal on phone and CW simultaneously. The logs continued to fill, and as evening quickly arrived we began to receive more and more attention on the bands. Pile-ups became raucous and sustained, and we were soon working friends in the States and Japan, although Europe was giving us good rates and we felt it best to take all callers. With time now less of an issue, Martin and Tim had arranged meals and tidied up to remove dust and grime from the buildings where we were lodging. Martin soon had dinner sorted, and Tim was able to take care of the generator, and take over on the 30M station. Incidentally, the Honda EU10 1KW generator was quiet, reliable, portable and efficient – it consumed only half the fuel we expected. Our operation continued during the night on CW, with Tim and Dom putting in the hours, and come morning we commenced SSB operations again. We were now ready to try 40M SSB, so a third antenna was erected to support our 40M dipole. With this extra choice we had a better chance of working EU during the day, and we would be ready for the DX later. We were disappointed that 40M did not give us much access to ‘G’, although we did appreciate the perseverance of those stations who were able to break the EU wall and work us, including club members back in Cambridge, Christian M0SCH and Christian M0TBF. Stations in GU and GJ were super-strong so we were delighted to add some locals to the log, too. Other than a brief (< 100 QSOs) spell on 17M, we were content to use 20M, 30M and 40M. Although an 80M dipole was constructed, we dismantled it for practical reasons – given the choice, we favoured 20M and hoped for more DX. We were fortunate indeed (SFI 66) to work many JA stations. Of particular note, though, were ZL1BYZ, VK4BUI and VP8NO who were able to work us on CW – a wonderful surprise. These days, even a small operation will suffer some deliberate QRM, and so it turned out to be for us, too. We were disgracefully jammed on 20M and 40M in particular, and had to avoid split operations on 40M as this seemed to reduce the problem somewhat. While not operating, I might add that we were able to enjoy Mediterranean conditions on Maîtresse. Swimming, photography and sleeping were popular past times while not operating on the radio. Our stay was also livened up by a few visits by passing yachts and even an ex-military French telegrapher, who was overjoyed to see us using morse code. We also met two contemporary dance students who were staying in one of the other huts, and were kind enough to tolerate our intrusion (before our departure, spare food and supplies were transferred to them). On Wednesday 5th September, we were picked up by the Pilot boat from Jersey Harbours and returned to St Helier, a little sunburned, but very happy to have made our mark on HF and given EU-099 a fresh airing. We spent a few more days on Jersey, staying at the Jersey YHA near St Martin (in its own right, a perfect HF location on a cliff top with spacious grounds). While there we met GJ7DNI by chance, having spotted a Versa tower passing by on his trailer. By Friday, we were unable to resist a visit to the Jersey Beer Festival in St Helier, before flying back to England the next day. There are 3083 unique callsigns in the log. 5 people contacted us on four bands, 51 on three bands. Top five countries: USA (18.0%), Germany (15.0%), European Italy (7.6%), England (6.1%) and European Russia (5.6%). A total of 86 countries were contacted. Breakdown by continent: EU (76.7%), NA (19.5%), AS (2.2%), AF (0.7%), SA (0.7%), OC (0.1%). Lastly, our QSL manager is Dominic M0BLF. The above links are all included on his page, at the top of the list of URLs above. We are indebted to Jersey Harbours, in particular to Peter Lawrence and Ian Lamy, whose advice alone before the trip was invaluable. We were fortunate and immensely grateful to also have their help in providing transport and access to the States building on this trip. Their generosity exceeded anything we could have expected – it made such a difference. Thank you again, from all of us at Cambridge University Wireless Society, for dedicating so much of your time to supporting us. It cannot be overstated how much we appreciated your help. This entry was posted in DXpedition, GH, IOTA, Trip on 2007-09-05 by . Our entry into this contest could probably be used as the basis of an article entitled “How Not to do a Contest.” We arrived on Heimaey mid-afternoon on Friday. Heimaey is the largest and the only populated island of the Westman Islands which all count for EU-071. The group of G3ZAY, M0TJH and M0BLF who had been on the mainland for a week were joined by M0TDG who flew out from the UK the day before the team headed for islands. The journey to the islands had been somewhat eventful as we had to divert down a bumpy unsealed road around the coast to avoid a blockade by lorry drivers and we also discovered that Iceland’s largest music festival was taking place on the islands the same weekend. Despite all this, it did not take us too long to find the tourist office who then put us in touch with owner of the site where we would be camping. The normal campsite for the island was being used for the festival so we were staying in the local scout site. Setup began that evening. We were entering the Multi/Single Low Power DXpedition category so all the antennas had to be single element. We started cutting dipoles for each of the contest bands and after the traditional CUWS inability to cut two dipole legs of the same length, we were ready to get on the air. We immediately found that conditions were extremely poor and very little could be heard. We had intended to try to make a lot of QSOs that evening to spread awareness of our activation but there were very few people we could contact. Other problems that we discovered that evening were that the computer cw keyer was not functioning correctly and the IC-706 we brought with us would not power up. Fortunately we had an FT-100 with us also so we still had a working rig. No amount of adjustment, tin foil or harsh language were able to fix these so we called it a night. The morning of the contest dawned bright and the good bit of news was that M0BLF’s stern bedtime words to the IC-706 the night before had got it working again. However, the cw keyer still caused problems so everything had to be sent manually and a new problem of intermittent S8 QRM that we never positively identified but we suspect came from the imersion heater in the hot water tank. We discovered an on air problem that as our callsign was not the same as the standard CEPT callsign (our call was G6UW/TF) and some operators refused to work us claiming our call was illegal. This did not seem to be a problem during the contest but it is unlikely that we will ever be able to tell. As the last few adjustments to the station were made (including deciding to build a 20m vertical instead of a dipole), the weather began to cloud over very quickly and the wind started to get up. As the contest started, a full Atlantic gale was blowing towards us. The contest started extremely slowly and it was very difficult to hold a QRG because of our weak signal. Greater success was had with cw although the keying was dodgy at best due to the complicated exchange and the computer keyer not functioning. As the day progressed, the gale outside strengthened and we discovered that the constant shaking of our telescopic masts was causing them to collapse in on themselves and then fall over. This happened several times and to make matters worse, whilst restoring our 20m vertical to a more vertical attitude, the mast snapped around 2m from the base. This was partially fixed but the mast was still notably shorter. As the evening wore on, we found out that the island’s airfield had been shut and some of the tourists trapped by the closure were being put up in scout building we were operating in. This meant we couldn’t use SSB much as it would disturb them too much. At around 0200, the combination of the appalling weather and both antenna masts falling within a couple of minutes of each other, we called it a night for a couple of hours to get a little sleep and allow the weather to improve. The wind had died the next morning and conditions were slightly better on the air allowing a few more contacts but by the time the contest finished, we had been limited to just 314 QSOs which gave us a paltry final score of just 137970 points. While this wasn’t a competitive score, it did give us a chance to see a little bit of the islands (though the weather limited this somewhat too) and it was good to provide a multiplier for other stations. Hopefully conditions will be better in the future allowing a much higher score. Checking reduced the score to 123546. This left us 85th in our category. Not a great result but we did provide a multiplier for quite a few others. Results can be found at http://iotacontest.com/2005/iotaScores.php?q=ims. This entry was posted in Contests, IOTA, Trip on 2006-10-21 by . The end of August saw the annual trip up to the Hebrides by CUWS. Tim, M0TDG; Tom, M0TJH; and Martin, G3ZAY, left on the Saturday afternoon to head up the A1 with the intention of activating the Monach Isles group (EU-111) as well as the main Outer Hebrides group (EU-010). With a brief overnight stop near Carlisle, we caught the ferry across to Lochboisdale on the Sunday afternoon. The weather was quite variable with some very heavy showers and a large swell in the middle of the crossing. The majority of our stay was, once again, in the excellent Gatliff Youth Hostels (see www.gatliff.org.uk). The first two nights were spent on the Uists. The hope of going to the Monach isles was scuppered by high winds and variable sea conditions. Instead, the time was used visiting local sights and a little operating was done by Tim from the hostel in Berneray. With little hope of an improvement in the weather, the group moved north to Harris to stay at the hostel in Rhenigidale. Whilst here, we also looked into the possibility of making a trip to the Shiant Isles (EU-112) but again, the weather was not suitable for the boatmen to take us there on any of the remaining days of the week. Some operating was performed from the hill behind the hostel and a good pile-up on 40m was achieved including a contact with CUWS member Michael, G7VJR, near Cambridge. The final few days of the trip were spent exploring the local paths. The weather closed in towards the end of the week and an attempt to climb the summit of Clisham was abandoned. Some operating was again attempted on the final evening but conditions were so poor that only a few contacts were made. On the journey home, we stopped off to pay a visit to GM4FAM and later G3WGV. We hope that we will see them again at the RSGB HF Convention next month. Overall, some 150 contacts were made from different islands in the EU-010 group of which around 30 were on CW and the rest on SSB. If there is sufficient interest there will be a return trip to the Hebrides planned next summer – probably to the Shiant Islands (see www.shiantisles.net). One of the large RIB operators in Stornoway will be booked to provide transportation as they are willing to operate in most weather conditions short of a gale. This entry was posted in DXpedition, GM, IOTA, Trip on 2006-08-31 by . Martin G3ZAY, Michael G7VJR, and Danny M0GMT visited the Outer Hebrides from August 23rd to 29th. The weather proved to be exceptionally windy and not only prevented a trip to St Kilda but resulted in an outbound rerouting via Skye instead of a direct ferry from Oban. Danny made some QSOs from Skye in the Inner Hebrides IOTA group (EU-008) and both Danny and Michael operated from the outer islands (EU-010). On the Summits on the Air (SOTA) front Michael and Danny activated Clisham, the highest peak in the outer islands, and Toddun which rises steeply from the youth hostel at Rhenigidale. Propagation from the summit of Toddun was particularly remarkable with a massive pile-up despite only 30W to a low dipole. The team visited Rockall veteran James Cameron MM0CYJ at his croft on South Uist and had a first hand account of the recent IOTA activation which made a couple of hundred contacts. James is keen to go back but a return visit seems unlikely in the next year or so as all his fishermen friends take their boats up north to Greenland during the summer. We will be staying in touch with him as he is always keen to visit the local IOTA groups (Monachs, Flannans, and Shiants) in his 19 foot dory and we may be able to mount a joint DXpedition next year. James is a keen 6m operator and we hope to contact him when we have our new SteppIR beam installed. This entry was posted in DXpedition, GM, IOTA, Trip on 2005-09-29 by . From the 22 July to the 1 August Martin (G3ZAY), Dominic (M0BLF) and Tom (M0TJH) made a visit to the Icelandic mainland (EU-021) and were joined by Tim (M0TDG) for the IOTA contest on the Westman Islands (EU-071). Glorious weather on the mainland meant that there was mostly sightseeing taking place. It was also found that the car battery of the rented 4×4 had very little charge and when on the air one night, the front panel on the rig started to dim after just 12 QSOs. The car then had a lot of trouble starting and it was decided that this source of power would not be used again. No other operating was possible before travelling to Heimaey in EU-071 and a full write-up of that operation is available in the contest section. TF/M0BLF/P was used from the Icelandic mainland and G6UW/TF was used from Heimaey in the Westmans before and during the contest. QSL info for both calls is via M0BLF. This entry was posted in DXpedition, IOTA, TF, Trip on 2005-08-01 by . Tim (M0TDG) and Martin (G3ZAY) made a brief trip to Jersey (31 March-4 April) for a long weekend during the Easter vacation. GJ6UW/P was active from the newly built youth hostel (highly recommended) in the town of Gorey on the east coast of the island. Once we had the station set up, we got on the air on 40m SSB just before our sunset. Conditions were excellent and we achieved our best DX of the weekend within a few hours with a contact with VK3. As the evening wore on, we switched to CW and had an extremely large US pile up by the time tiredness (and an extremely loud side tone that even the headphones could not block out from the rest of the room) got the better of us. We called it a night. 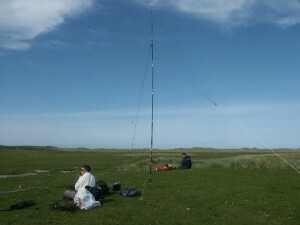 Sadly, conditions on the higher bands were far worse and were not repeated on 40m again that weekend. Overall, some 600 QSOs were made of which 450 were on CW. This entry was posted in DXpedition, GJ, IOTA, Trip on 2005-04-04 by . 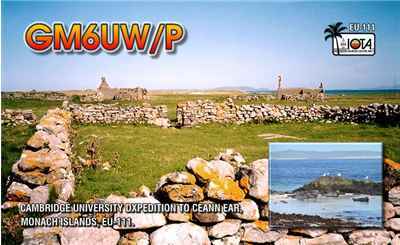 CUWS (M0TDG, M0BLF, M0NKI, M3OXY, and G3ZAY) made a short DXpedition to the Outer Hebrides at the start of September (6th-10th) and operated briefly from the Monach Islands (400 QSOs from two stations in about 6 hours of activity) and three summits (for the Summits on the Air Programme). An attempt to reach St. Kilda was thwarted by a poor weather forecast which caused the operator of the Rigid Inflatable Boat (RIB) on the west coast of Lewis to cancel the trip. This entry was posted in DXpedition, GM, IOTA, Trip on 2004-09-10 by . 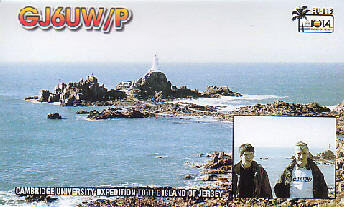 The CUWS was active for two days (15-17 February) from Jersey in the Channel Islands as GJ6UW/P. Jersey counts as EU-013 for the RSGB’s Islands on the Air award scheme. Dominic (M0BLF) and Martin (G3ZAY) were operating. We were active from a location in the centre of the island, St. Lawrance Parish, and worked on all bands from forty to ten metres, SSB. Due to the ARRL CW contest, which was on over the weekend, we did not operate any CW. Topband and eighty metre operation was also not possible, due to high winds which meant that we couldn’t get the antenna raised. In total, 1533 QSOs were made in the forty-eight hours between Friday and Sunday afternoons. This entry was posted in DXpedition, GJ, IOTA, Trip on 2002-02-17 by . A torrid tale of Martin Atherton, G3ZAY, and his motley crew taking to the high seas to reach the furthest outposts of the empire! For several years Cambridge University Wireless Society members have been activating British island groups for the RSGB’s Islands on the Air (IOTA) Award. Previous conquests include the Treshnish, Summer, Monach, Shiant, and Farne Is, as well as the treacherous reefs of the Plateau des Minquiers near Jersey. In most cases the operations were the first time the islands had been on the air. 1989 saw only two possible new ones on the IOTA list; the Flannan Islands which lie about 20 miles west of the Outer Hebrides, and, 150 miles further on, the tiny stump of Rockall. The latter being rather too challenging logistically for a major expedition, the Flannans were chosen as the main destination. The next problem was how to get there. Transportation for previous island visits had usually been on local fishing or tourist boats willing to deviate from their normal routes for an hour or two on payment of a modest fee. Unfortunately, this clearly wasn’t going to work for the Flannans which are a long way from the nearest harbour and are never visited by commercial tourist craft. We were clearly going to have to find some other way this time. Enquiries at the tourist office in Stornoway revealed that the 40 foot, 10 berth yacht ‘Annag’ was available for charter, complete with skipper, by the day or by the week. Fully equipped with Deers navigator, radio and outboard-powered rubber dinghy, it seemed ideal. After a quick conference and unable to face the prospect of booking just a couple of days and finding ourselves confined to harbour by bad weather, we committed ourselves to a full week which we hoped would allow us to fit in a visit to St Kilda in addition to the Flannans. Martin G3ZAY, Chris G6VMA, Catherine G6OQA, Andrew G0HSD, and Mark G1XMO drove up with all the equipment via Skye and the Uig-Tarbert ferry whilst Don G3XTT jetted (well turbo-propped) in to meet up on the day before departure: Friday July 7th. The boat was anchored at Amhuinnsuidhe (pronounced Av-In-Soo-Ee) in West Loch Tarbert, an idyllic spot graced with a magnificent Victorian castle and a sea loch where the salmon were jumping so frequently it seemed you only had to hold out a hand to catch them. The equipment and food supplies had to be ferried across in the rubber dinghy, a process which took several hours, but we were able to check in to the IOTA net using a mobile rig on the quayside and keep them up to date on our progress. The skipper, Donald Wilkie, wisely insisted on a safety lecture before departure and included individual tuition in the use of the toilets or ‘heads’. It seemed that incorrect flushing could result in the entire boat filing with water out of the lavatory pan! We were excused sailing lessons as an experienced ‘Number One’ had joined us in the form of Billy Mackinnon, ex-Merchant Navy and a business studies lecturer at the local college. Setting out at 1600 we discovered the wind was coming directly from the Flannans so rather than spend many hours tacking to and fro we started the engine and lined up on he exact compass course. Steering was quite an art as even a slight swell tended to deflect the boat and the natural tendency to over-correct resulted in a rather zig-zag wake. The islands were clearly going to be further than the straight line 30 miles the way we were going. The boat normally boasted a very fine auto-steering system capable of holding a course better than the most experienced helmsman but in common with much else on board Annag it was defective. Donald gradually broke the news to us that the Decca navigator system was a bit temperamental as it would not work with the engine running or if the battery volts were too low, there was a loose connection in the depth sounder, and the VHF aerial had snapped off! The aerial we could and did fix and ‘Annag’ was quickly back in touch with the coastguard with a quarter wave whip on the rear of the boom. We attempted maritime mobile operation with an HF whip but the lack of any metallic surface for it to work against caused severe RF feedback. A dipole would probably have worked well, but by this time, and despite Stugeron sea-sickness pills, none of us felt like going into the forward cabin to unpack the necessary boxes. The sickness problem was solved later on when we realised that the recommended dosage, adequate for a gentle car ferry crossing, could safely be exceeded. Most of us felt fine on a triple dose though G0HSD did claim to be seeing blue Ford transit vans off the port bow after swallowing a full packet. His callsign phonetics are now ‘Heavy Stugeron Dose’. At the risk of a lawsuit from the manufacturers I can report that the elasticated wristbands had no apparent effect. We were all sceptical about them from the start not least Donald who had seen acupuncturists and homoeopathic doctors reduced to swallowing Stugerons by the dozen so perhaps this diminished their placebo potential. Visibility was poor most of the way across and the only interest en-route was when we passed through a fleet of foreign trawlers taking advantage of the imminent Sabbath (and hence the absence of all local craft). The Flannans came into view at around 2100 and by 2230 we were anchoring in the lee of Eilean Mor, the largest of the group. Donald and Billy set off to reconnoitre the old landing stage, constructed along with the lighthouse in 1895, and returned to pronounce the sea-level steps unusable. This only left the main loading platform some 10 feet up the cliff, reached by a steel ladder. All the equipment had to be ferried across by dinghy and then hauled up to the platform on ropes. There were some heart-stopping moments with the generators and rigs as the swell threatened to dash the dinghy against some sharp projecting bolts, but thanks to Donald’s seamanship and G3XTT’s brute strength everything made it safely ashore by dusk at around 2330. Unfortunately, Eilean Mor rises almost sheer to a grassy plateau about 25Oft asl so we had to carry everything up a tortuous route of broken concrete steps followed by a scramble up the old cliff railway trackbed. The railway had been constructed to lift supplies up to the light-house but was dismantled about 20 years ago when the light became automatic and helicopter access the norm. DXpedition tip: Always take at least one Territorial Army officer with you. Chris, G6VMA and Don, G3XTT, true to their training, actually appeared to enjoy labouring up a crumbling path with a Honda generator or HF rig under each arm. The rest of us would probably have voted to dismantle them and take them up a piece at a time! By about 0100 everything had been carried up but too exhausted to operate we collapsed into the tents for a rest. Adrenalin levels did not allow much sleep and we were up at 0500 erecting antennas and made the first QSO with G3TOK at 0530 UTC. Daylight was of course no problem as it never really got dark; there was just a fairly deep twilight from 0000 to 0230. 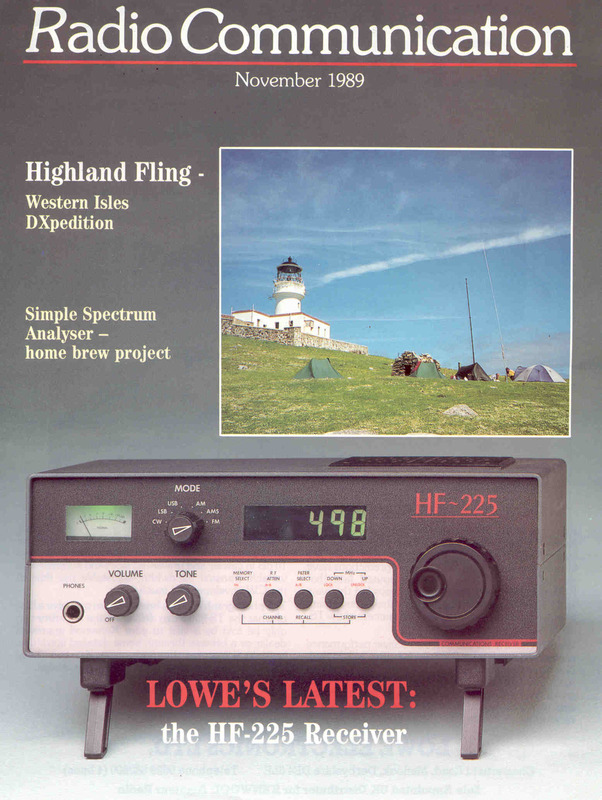 The equipment used was an FT101ZD plus KW1000 linear, with a TS120S as a second station. Power came from two Honda generators and a car battery. A 40OW Honda powered the FT101ZD and a 65OW Honda allowed the linear to generate about 300W output. The TS120 was quite happy running off the battery. On previous trips the Hondas performed faultlessly but on this occasion both played up. The smaller developed a blocked silencer and the larger, a sticking carburettor. At times we were wholly dependent on the car battery while G1XMO went to work on them with the limited tools we’d brought. For antennas we had taken a Butternut HF6V vertical, a 24ft telescopic aluminium mast and dipole kit on loan from the Territorial Army, and all the makings for a 10/15m quad together with eight four foot sections of interlocking 2in steel tube. The steel sections were heavy and had been left on the yacht until we knew how the Butternut would perform. They were to stay there for the whole trip as the HF6V exceeded our expectations on all bands. With only a handful of nonresonant radials we had no trouble working into W6 and VE7 on HF and across Europe on LF. The army dipole kit was a great help as it gave us a simple second antenna which could be retuned easily to whatever band we wanted. Nothing tricky about it, just a spool on each end to take up excess wire, a table of length against frequency (different from what you might expect because of the end-loading of the spools), and coloured markers every metre along the wire. To lower the operating frequency we just uncoiled more wire. With two stations on the air it was time for the off-duty ops to explore the island. The light-house buildings were securely locked and of little interest anyway, but a little way down the hill there was a one room dry stone shack marked on the O.S. map as an ancient chapel. Local opinion was that it was more likely to have been a shelter built in the sixteenth or seventeenth century by fowling parties from Lewis or Harris. We learned that the Flannans had been a good source both of sea-birds and their eggs and had been regularly farmed. These early visitors had apparently developed a range of superstitions associated with their landings. They would not land if the wind changed on the voyage out, they would leave their clothes on a special rock, would avoid the use of certain words and would never kill a bird with a stone or before all members of their party were safely ashore. With no hunting taking place today the seabird numbers have increased enormously and the eastern side of Eilean Mor we found to be carpeted with Puffins. Unaware of any danger they would allow people to approach within a few feet before taking to the air. The WX during our stay was reasonably good. A brisk wind blew in from the south-west during Sunday but the tents stayed in place, helped by a few large rocks, and ‘Annag’ was well sheltered in the lee of the island. Visibility at one point increased enormously and we were able to see the outline of St Kilda on the horizon some 40 miles away. Nearer at hand we could also see the adjacent islands of the group some 4 miles west and in a different WAB square. Despite repeated requests on the 80 and 40 metre nets we decided not to attempt a landing as the sea was getting quite rough and there was no safe spot. The majority of people seemed to know where the islands were though a few persisted in calling them the Flannels. A most interesting QSO was with a GM3 who had been one of the last lighthouse keepers to be permanently stationed there in the ’60s. He reminded us of the mystery disappearance of three keepers in 1900 when the supply ship arrived to find a half eaten meal and nobody to be seen. It was eventually assumed they had been washed off the cliff path by a freak 100 foot wave. Perhaps they had used one of the proscribed words or left their clothes on the wrong rock! During Monday evening we conferred with Peter G3VIE, who works for the Met Office at Bracknell, about the best time for departure to St Kilda. His advice was to go as soon as possible as the conditions were likely to deteriorate during Tuesday with a Force 7 wind developing. Although we had been hoping for a good night’s sleep and a leisurely sail across on Tuesday morning we decided to set out at once. There followed a frenzy of packing up and portering and we finally had ‘Annag’ loaded by about 0300. Needless to say the wind was coming at us directly from St Kilda so once again the engine was started and we chugged off to the south-west. One hour later the engine spluttered, stopped, and refused to re-start leaving us no option but to hoist sail and make the best course we could (about 40 degrees off the required track). Donald disappeared head-first into the bowels of one of the lockers in order to change what appeared to be a dirty fuel line and Billy emerged with the welcome news that a gale warning had just been issued. A little later Donald was still head-down in the locker and a muffled shouting could be heard. On investigation it seemed that he had become stuck after a few minutes and been unable to attract our attention! Around 0900, as a result of Donald’s labours (and thanks to the Jubilee clips off our camping stove) the engine was restarted and we were able to resume a proper course. Or rather, we would have been able to if we had known where we were! The batteries had run flat so the Decca navigator put us in the middle of the Sahara and we had only a rough idea of our course and speed over the previous 5 hours. Donald spent some time on a dead reckoning estimate before announcing our new course as the visibility was poor and we would need to pass reasonably close to St Kilda to sight it. Fortunately his experience paid off and the cliffs of Hirta came into view at around 1400 not too far from where we had been expecting them. However, just as we were looking forward to getting ashore the WX took several turns for the worse. The wind got up to Force 8-9, visibility dropped to a few hundred yards, and the sea became quite rough with waves up to about 15ft high. The island was no longer in view and the Decca still thought we were south of Timbuktu! Inexperienced sailors would probably have given up any thought of making St Kilda and headed off for open sea but Donald was made of sterner stuff. Steering by the wave direction and making use of a small amount of mainsail he inched his way blindly into the lee of Dun, a small island guarding the entrance to Village Bay. The first few miles took about three and a half hours with ‘Annag’ actually being blown backwards at times. It was rather depressing to glimpse one of the outlying stacs through a temporary gap in the mist and then see it in the same place through another gap half an hour later! Village Bay was a welcome respite from the storm though clearly it was far from being a perfect harbour. Every few minutes a squall would come racing down the hillside and shake the yacht violently. Passengers en route to the jetty would invariably get drenched with spray blown off the surface of the sea. Down below things were equally wet as one of the hatches had not been closed property and most of the clothes and sleeping bags were soaked through. First impressions were of a misty rainswept island rising steeply from the sea with a cluster of grey military buildings by the shoreline and a veritable smallpox of drystone constructions on every non-vertical surface. These were the cleits or storage bins, built by the St Kildans when the island had a permanent population. The old village, evacuated in 1930, was visible as a line of mostly roofless dwellings in an arc around the bay. It was a rather wet and bedraggled group that climbed onto the quayside to be welcomed by the Battery Sergeant Major of the St Kilda Royal Artillery Detachment. Our arrival was expected as we had already written to the Army and the National Trust for Scotland for landing, camping, and operating permission and we were given a warm welcome. The sergeants mess made clothes dryers available and things were soon looking up. The camp site even had hot showers. We were pleased to find that the island boasted its own pub ‘The Puff Inn’ but, for the first night, were unable to take much advantage of it because of the high levels of Stugeron in our bloodstreams. Renowned for its relaxed closing times and rowdy parties ‘The Puff Inn’ was also, we were told, famous for its meat pies. Needless to say they were off the menu the night we arrived and we had to be content with crisps and peanuts. Don, G3XTT, got a station on the air as soon as the tents were up but succumbed to exhaustion after an hour or so and like the rest of us collapsed into a sleeping bag until late Wednesday morning. Wednesday and Thursday were much brighter days and we got a clear view of the other radio installations on the island. The RA missile tracking equipment consists of a number of radomes an the peaks of Mullach Mor and Oiseval together with a 240 foot steel tower right on the summit. Access is by a narrow, winding, single track road suitable only for four wheel drive Land Rovers driven by specially qualified and tested drivers. Winds regularly demolish the radomes and have been known to blow the Land Rovers onto their sides! Down below, the operating QTH was well screened by steep 1000’ hillsides but the Butternut did its stuff and we had no problem working the IOTA enthusiasts in Europe and the USA. 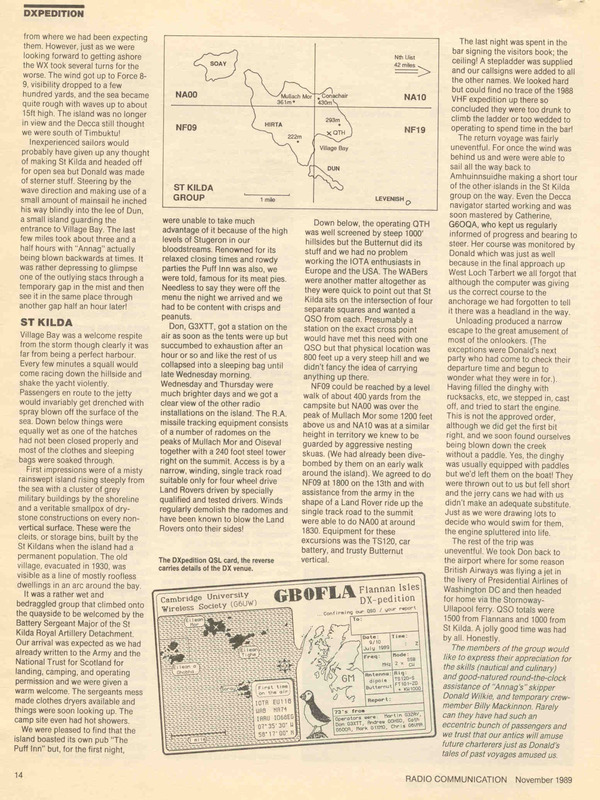 The WABers were another matter altogether as they were quick to point out that St Kilda sits on the intersection of four separate squares and wanted a QSO from each. Presumably a station on the exact cross point would have met this need with one QSO but that physical location was 800 feet up a very steep hill and we didn’t fancy the idea of carrying anything up there. NF09 could be reached by a level walk of about 400 yards from the campsite but NA00 was over the peak of Mullach Mor some 1200 feet above us and NA10 was at a similar height in territory we knew to be guarded by aggressive nesting skuas. (We had already been divebombed by them on an early walk around the island.) We agreed to do NF09 at 1800 on the 13th and with assistance from the army in the shape of a Land Rover ride up the single track road to the summit were able to do NA00 at around 1830. Equipment for these excursions was the TS120 car battery, and trusty Butternut vertical. The last night was spent in the bar signing the visitors book; the ceiling! A stepladder was supplied and our callsigns were added to all the other names. We looked hard but could find no trace of the 1988 VHF expedition up there so concluded they were too drunk to climb the ladder or too wedded to operating to spend time in the bar! The return voyage was fairly uneventful. For once the wind was behind us and were were able to sail all the way back to Amhuinnsuidhe making a short tour of the other islands in the St Kilda group on the way. Even the Decca navigator started working and was soon mastered by Catherine, G6OQA, who kept us regularly informed of progress and bearing to steer. Her course was monitored by Donald which was just as well because in the final approach up West Loch Tarbert we all forgot that although the computer was giving us the correct course to the anchorage we had forgotten to tell it there was a headland in the way. Unloading produced a narrow escape to the great amusement of most of the onlookers. (The exceptions were Donald’s next party who had come to check their departure time and begun to wonder what they were in for!) Having filled the dinghy with rucksacks, etc, we stepped in, cast off and tried to start the engine. This is not the approved order, although we did get the first bit right and we soon found ourselves being blown down the creek without a paddle. Yes the dinghy was usually equipped with paddles but we’d left them on the boat! They were thrown out to us but fell short and the jerry cans we had with us didn’t make an adequate substitute. Just as we were drawing lots to decide who would swim for them, the engine spluttered into life. The rest of the trip was uneventful. We took Don back to the airport where for some reason British Airways was flying a jet in the livery of Presidential Airlines of Washington DC and then headed for home via the Stornoway-Ullapool ferry. QSO totals were 1500 from Flannans and 1000 from St Kilda. A jolly good time was had by all. Honestly. The members of the group would like to express their appreciation for the skills (nautical and culinary) and goodnatured round-the-clock assistance of ‘Annag’s’ skipper Donald Wilkie and temporary crewmember Billy Mackinnon. Rarely can they have had such an eccentric bunch of passengers and we trust that our antics will amuse future charterers just as Donald’s tales of past voyages amused us. 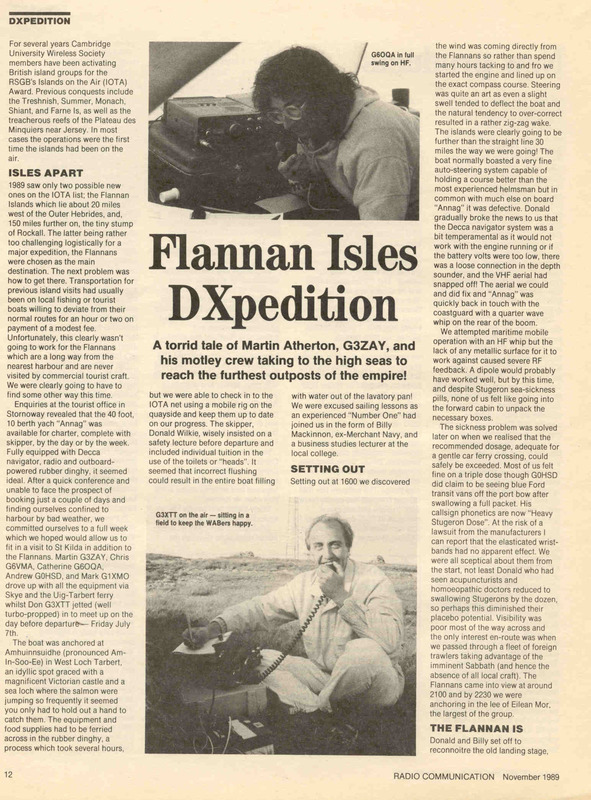 This entry was posted in DXpedition, GM, IOTA, Trip on 1989-04-09 by . 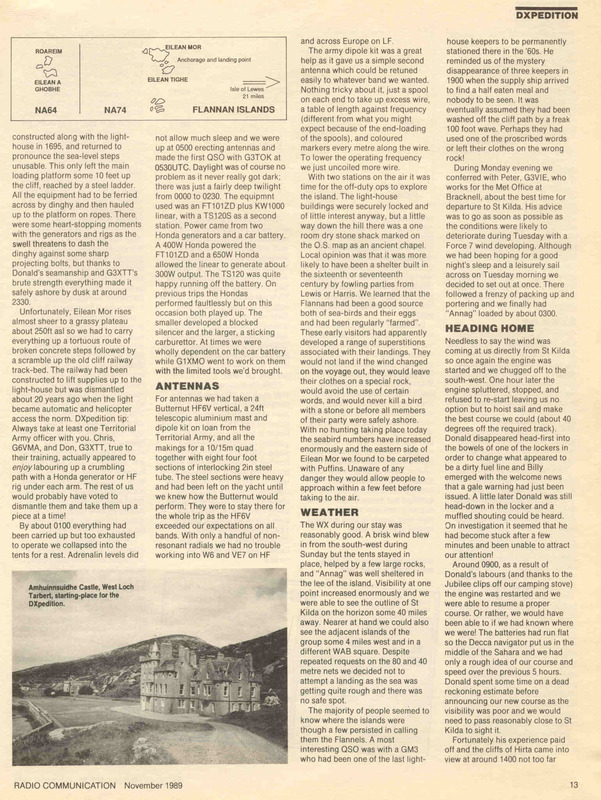 Here is an extract from a 1972 issue of Short Wave Magazine containing an article by R Wainwright G3YMH on the Easter 1963 G6UW trip to Switzerland. CUWS Expedition to Switzerland. This entry was posted in DXpedition, HB9, Trip on 1972-04-09 by .